Once again going on the offensive by asserting design patents in its portfolio, Oakley, Inc. (Oakley) filed a complaint for patent infringement against Sunscape Eyewear, Inc. (Sunscape) on February 14, 2014, in the Southern District of California (14Cv0358-BTM-DHB). D620,970 (‘970 patent), issued in 2010, claiming an Eyeglass Component. Oakley asserted that the Defendant allegedly manufactured, sold, offered for sale and/or imported into the United States eyewear allegedly infringing Oakley’s patent rights. Oakley further asserted that it had provided the public with constructive notice of its patent rights by marking its products. 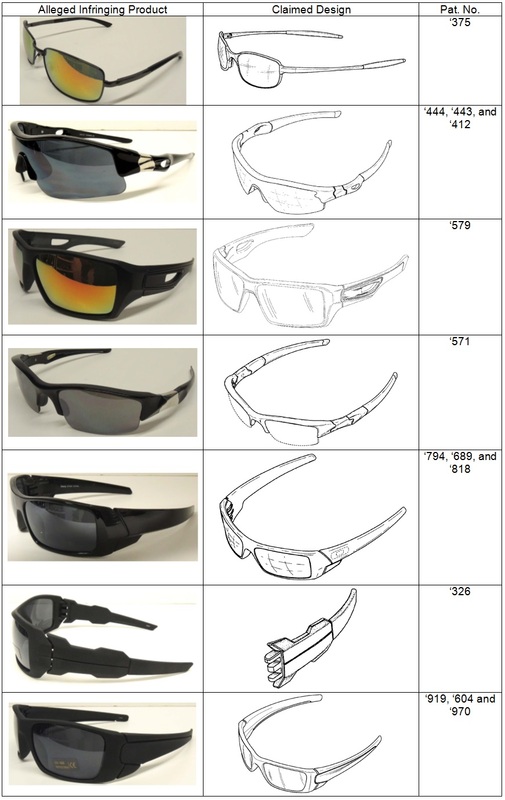 In the complaint, Oakley claimed that the Defendant was “knowingly, intentionally and willfully infring[ing] … [the above-noted design patents] by making, using, selling, offering for sale and/or importing eyewear” allegedly covered by these design patents. Oakley asserted that the Defendant had knowledge of the patents, infringed with reckless disregard for Oakley’s patent rights, and knew or should have known that its actions constituted infringement. Exhibits in the complaint included the above-noted patents, together with representations of the products allegedly infringing these patents. These representations, along with selected Figures from Oakley’s patents, are reproduced alongside in the chart below. Oakley requested that its thirteen patents be deemed valid and willfully infringed, with a preliminary and permanent injunction against the Defendant, and payment of “all damages suffered by Oakley and/or Defendant’s total profit from such infringement” to Oakley. Further demands included a trebling of damages, an award of attorney fees, and pre-judgment and post-judgment interests and costs. A jury trial was requested.